This 3 part medical quality human skull replica is a first choice for basic anatomical studies of the skull. It also makes a great present for medical professionals and students of medicine and allied health professions. Handmade from hard, unbreakable plastic .Can be disassembled into skull cap, base of skull and mandible. Mandible is mounted on a spring to easily demonstrate natural movement. Each tooth individually cast for realistic dentition. 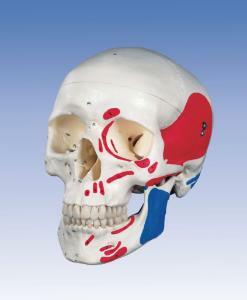 In the Painted version the muscle origins (red) and insertions (blue) are shown in color on the left side of the skull.